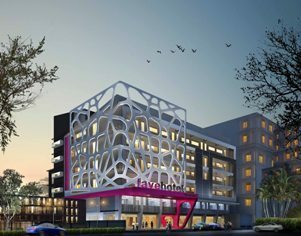 Jakarta, June 10th 2013 – Archipelago International is proud to announce the opening of the new-build favehotel Gatot Subroto in Jakarta. It will be favehotel’s six hotels in Jakarta. This stunning hotel presents a uniquely designed, value priced hotel with its Fun atmosphere, Fresh attitude and Friendly services. The favehotel Gatot Subroto offers 150 guest rooms all equipped with LCD TV’s, individual air conditioners, en-suite bathrooms with standing showers as well as FREE High speed Wi-Fi throughout. Each room also has an easy to use security key card locking system for extra safety and peace of mind. The hotel also features a delightful Coffee Shop and contemporary meeting rooms furnished with latest technology. Coupled with an outstanding location in the heart of Jakarta and allows easy access to Jakarta's entertainment and shopping venues includes Pacific Place Mall, Planet Hollywood and many of the city’s other top night spots.